Janata Dal-United leader Ali Anwar on Sunday said that the Bihari community knows how to get rid of communal forces. Reacting to the Patna visit of Bharatiya Janata Party’s prime ministerial candidate Narendra Modi, Anwar demanded to know why the Gujarat chief minister did not visit the blast victims in the hospital after the rally on October 27. “Today is Deepawali. It is a festival that signifies good over evil. The communal forces, the forces that divide the nation will be cleaned. The Bihari community knows how to get rid of these communal forces. Let some go around and spread hatred, but people will not let this happen,” he said. He also defended Bihar Chief Minister Nitish Kumar, after the opposition claimed that he did not meet the blast victims. “Nitish Kumar went to the hospital in Patna to meet the victims. In fact he was the first one to reach the hospital. Where was Modi that time? 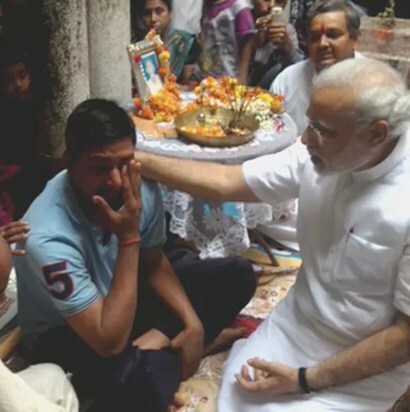 After the rally, Modi could have gone to the hospital to see the victims,” he added. Modi, who arrived in Patna on November 1, met the families of the six people on Saturday, who were killed in serial blasts ahead of his massive ‘Hunkar’ rally on October 27. Four people have been arrested in the case so far, while several others have been detained. Meanwhile, BJP leader Mukhtar Abbas Naqvi criticised the opposition for attacking Modi after he visited the family members of the Patna serial blast victims. “The blasts that happened in Patna were a terror attack. And if Narendra Modi has gone to Patna to visit the victims, where is it written that this is wrong,” he questioned. The opposition has maintained that Modi’s Patna visit was politically motivated. Congress leader Rashid Alvi asked why Modi did not visit Muzaffarnagar where more than 60 people were killed in communal clashes in October. “Did Narendra Modi really go there to sympathise with the victims of Patna blasts? Why didn’t he go to Muzaffarnagar? He is not even talking about Muzaffarnagar. This is purely politics and nothing else. People of this country are aware that Modi’s Patna visit is political. And this kind of politics is very unfortunate,” he said.